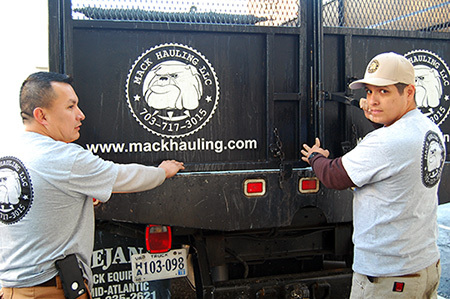 Mack Hauling provides friendly, up-front estimates at no charge or obligation. Call or email us today to set up an appointment for your free estimate. We will do all of the bagging, packing, lifting, loading, and carrying so you don’t have to lift a finger. Just show us what you want removed and leave the rest to us. We pick up and haul away just about anything. From home clean outs, to office clean outs, tenant clean outs, or a foreclosure, you can count on us! 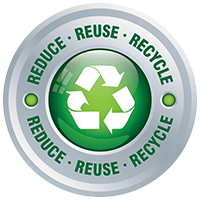 Do you need commercial junk removal for your construction site or maybe real estate staging of a home to sell? Moving? Get rid of the junk you don’t want to bring with you to your next home. We are bonded and insured. Our prompt, professional, uniformed employees complete the job in one day. Guaranteed quality service regardless of the season. We work all year round! We specialize in clean-out services. There are 6 steps to our process. Step#1: You call us and schedule a free estimate for one of our trained specialists to come to your home or business and give you a written estimate of our service and the total cost for the job. Step#2: You schedule a day and time you would like the job done. Jobs can at times also be performed the same time that the estimate is given. Step#3: 2 to 4 employees show up at your door at the scheduled time, introduce themselves and assure you they will handle everything for you. Step#4: We load up in our trucks and trailers with the items requested to be removed and being careful not to damage anything we pack the items tight and efficient so they can all fit. Step#5: We clean up our mess and the areas we took items from and sweep them broom clean. Then we ask if there is anything else we can do for you. Step#6: We thank you for your business, ask you to call again and hope you will leave us a Review on our website or other social media options sharing we did a job well done in a timely manner. All appliances including refrigerators, freezers, stoves, washers, dryers, and water heaters. Furniture including couches, sofas, chairs, tables, mattress, beds, dishes, linens, and more. Landscaping stones, rocks, timbers, hot tubs, decks, tree branches, sod, firewood, junk pile up, sheds, pools, patios, fences, patios, decks, all non-garbageman friendly items! 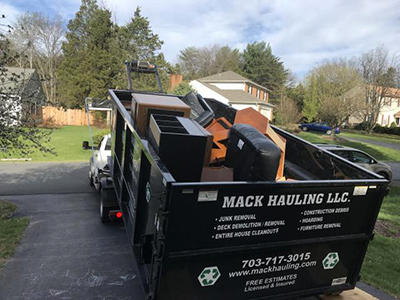 We perform junk removal services in the Clifton VA area including Westfields, Ivakota, Yorkshire, Makleys Corner, Buckhall, Signal Hill and all surrounding areas. We will provide tenant cleanout services to apartment complexes in or near the Silver Spring MD area including apartment complexes such as The Point at Park Station Fairchase, Woodway at Trinity Centre, Battery Heights Apartments and any others. 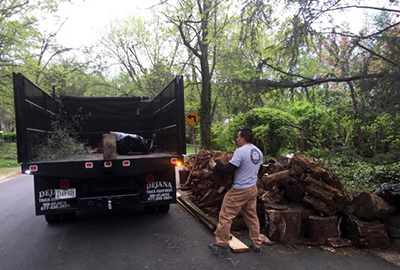 Your best choice in Commercial & Residential Junk Removal in Clifton VA.